For our summer fair desserts we’ve selected recipes that are simple and quick to make but that result in a very attractive light and summery dessert. We’ve included recipes for a muffin pudding that’s just peachy, tangy lemon meringue pie and a banana cheesecake that isn’t too rich. Use aluminium foil containers for baking these recipes and they’re all ready to be transported to the summer fair. A chilled cheesecake with a biscuit base rather than a baked one. Crush the biscuits. Melt the margarine and mix together. Use to line the base of a 8” tin. Chill. Put the gelatine in a small bowl with the cold water and place it over a saucepan of boiling water. Don’t let the base of the bowl touch the water. Stir until the gelatine has dissolved. Mash the bananas and add the lemon zest, juice and 2 oz caster sugar. Mix together. Beat in the cheese, egg yolks and cream. Stir in the dissolved gelatine and mix well. Whisk the egg whites until stiff. Whisk in the remaining sugar, and then fold lightly into the cheese mixture. Pour onto the biscuit base and leave for 3 to 4 hours to set. Decorate if you wish with swirls of whipped cream and banana slices (dipped in lemon juice to prevent browning). Instead of a pastry base, we’re using a crispy biscuit base. Crush the biscuits. Melt the butter and stir the biscuit crumbs in, making sure they’re all well-coated. Use to line the base and sides of a 9” flan dish. Set aside. Preheat the oven to 170 degrees C, gas mark 3. In a saucepan, mix together the lemon zest, juice and cornflour. Very gradually add the water, stirring well in between additions. Cook over a low heat, stirring constantly, until the sauce thickens. Beat in 2 oz caster sugar and allow to cool slightly before beating in the egg yolks. Pour on top of the biscuit base. Put the egg whites in a large spotlessly clean bowl. Whisk until soft peaks form. Whisk in 2 oz caster sugar a spoonful at a time, until stiff peaks have formed. Fold in the remaining sugar and vanilla essence. 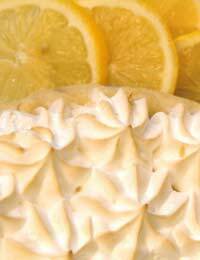 Spread the meringue over the lemon filling and bring it to little peaks with a fork. Bake for 35 to 40 minutes. Allow to cool and then chill. This recipe puts a muffin–like topping over lovely summer fruits. Preheat the oven to 180 degrees C, gas mark 4. Quarter the peaches and remove the stones. Place in a single layer in a shallow dish. Drizzle the orange juice over and sprinkle with the brown sugar. Bake for about 15 minutes. Meanwhile, sieve the flour, baking powder and cinnamon together into a large bowl. Stir in the caster sugar and make a well in the centre. In a different bowl, whisk together the milk, yogurt, egg and melted butter. Stir in the orange zest, then pour into the well in the dry ingredients. Mix lightly. When the peaches are ready, put spoonfuls of the cake-mix on top of the peaches. It doesn’t matter if bits of peaches are sticking out. Sprinkle with a little extra brown sugar and return to the oven for another 20 to 25 minutes, or until the topping is cooked and golden.